Sept 19, 2016 — xiQ, Inc., a leader in real-time personalized market intelligence, is pleased to announce that it is the recipient of the 2016 Content Marketing Award for Best Integration of Mobile Devices in a Content Marketing Program. The prestigious award was given by the Content Marketing Institute (CMI), a leading global content marketing education, training, research and consulting organization. xiQ was selected as a winner based on its Genpact Market Watch Mobile App configured for Sales Intelligence. GE-spinoff Genpact ( NYSE : G ), a global leader in digitally powered business process management and services and architect of the Lean Digital enterprise, uses xiQ’s Marketing Intelligence Platform, with IBM Watson. The platform, and corresponding mobile application is used enterprise-wide by its global leadership, sales and marketing teams. With xiQ, Genpact can identify real-time market intelligence to further strengthen its ability to support client growth, efficiency and business agility. 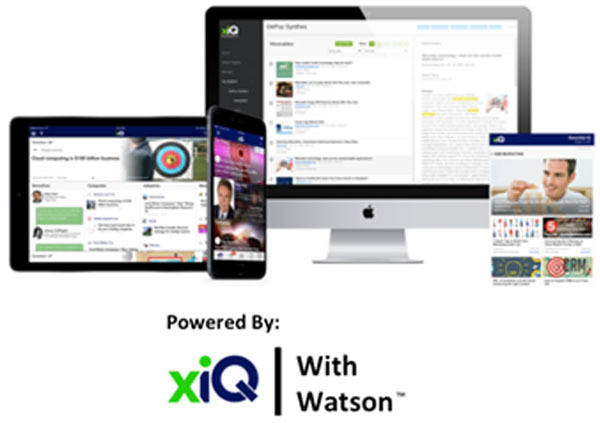 xiQ’s Marketing Intelligence Platform leverages multiple IBM Watson to help companies analyze unstructured data from the Internet, social media and public records. This analysis, combined with xiQ’s other content marketing abilities, empowers sales and marketing teams with real-time insights that can improve engagement with customers and prospects. xiQ’s platform accelerates and enhances the value of investments in CRM and Marketing Automation tools like Salesforce.com, Pardot, Marketo, and Hubspot among others. The xiQ app can be downloaded free for iOS devices. Follow xiQ on Linkedin and Twitter.